I’m really picky about salad dressing, but this Miso Sesame salad dressing is delicious. A friend of mine bought me a bottle and told me it was her favorite and now it’s my favorite too. The ingredient list is short and contains all good stuff: miso, honey, sesame seeds, rice vinegar, sesame seed oil, spices and salt. The calories are low too. Two tablespoons are only 50 calories and two grams of fat. Shake, shake, shake and pour it on! ← Should you get the flu vaccine? 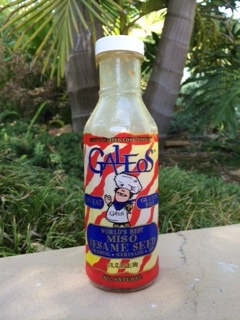 Where can I buy this dressing? You should be able to buy it at Vons or Albertsons.